If you are someone who makes videos, records music, takes photographs, podcasts or has a genuine interest in the Media you consume, this is the course for you. Our alumni are Directors, Producers, Sound Designers, Camera people, Musicians, Editors, Comedians, Advertising Executives, Lighting Experts and more besides. We keep in touch with Industry and adjust the course each year to ensure that our graduates are as prepared for the Media Landscape as they can be. We have a state of the art HD Television Studio. A professional recording studio for the creation of Music, Sound Design and Radio using ProTools. We put equipment in your hands early and often, encouraging you to learn by doing. We also have an Erasmus link with Stadin Media College in Helsinki, allowing some students to have a 6 week work placement in Finland during the second year with us. Students going will be selected by interview during the second year. The course works hard to refine your interests while helping you understand every aspect of Media Production. Year 1 – Here, we introduce you to all the major disciplines. In TV you will work on Studio Programmes as well as producing and editing a wide range of material shot on location. Sound is served by Radio Production and Music Technology. Photography develops your eye and image manipulation abilities. Media Analysis helps you take apart television, film and radio so as you better understand how it’s made. Intercultural Studies and Communications prepare you for the Ireland we live in today and Work Experience gives you an opportunity to gain your first foothold in a real Media job. Year 2 – In your second year, the pace picks up. Sound will focus on the growing area of Sound Design and develop your scriptwriting abilities with Radio Drama. TV expands into more complex programme making, planning, shooting and editing from day one. The introduction of Creative Industry &TV & Film Production Practice will ensure your process is in line with industry. You will have a chance to work on an Individual Project to test your growing skillset, and you’ll expand your knowledge of how films are made in Film & TV Studies. Year 3 – Your final year of the core programme expands your abilities still more. In both Sound and Television you’ll work on Broadcast standard Documentaries and real world projects with actual clients. You’ll have the opportunity to develop your own solo and collaborative work. Your academic ability will be bolstered in Professional Development. In third year, your work experience can lead to a job directly after graduating. But it also prepares you for the top up degree. A genuine interest in the field of Media, Leaving Certificate (including LCA) and interview. Previous Media experience will help your application but is not absolutely necessary. We encourage students to bring a sample of work to the interview. This could be anything you have written (e.g. script, story, poem, school essay), photographs you have taken (either on phone or camera), or any other media work you would like to show. You should also be prepared to discuss your favourite TV shows/music/ films etc. See also the FAQ section of our website for further guidance on questions you may be asked at interview here. Mature Students are also actively encouraged. We can consider applicants for Advanced entry into our HND Programme if they have completed a similar QQI award at another institution or have accrued substantial Media experience. Progression to the final year of the BA (Hons) Media, at the University of Wolverhampton, University of Central Lanchashire and a number of UK Universities. 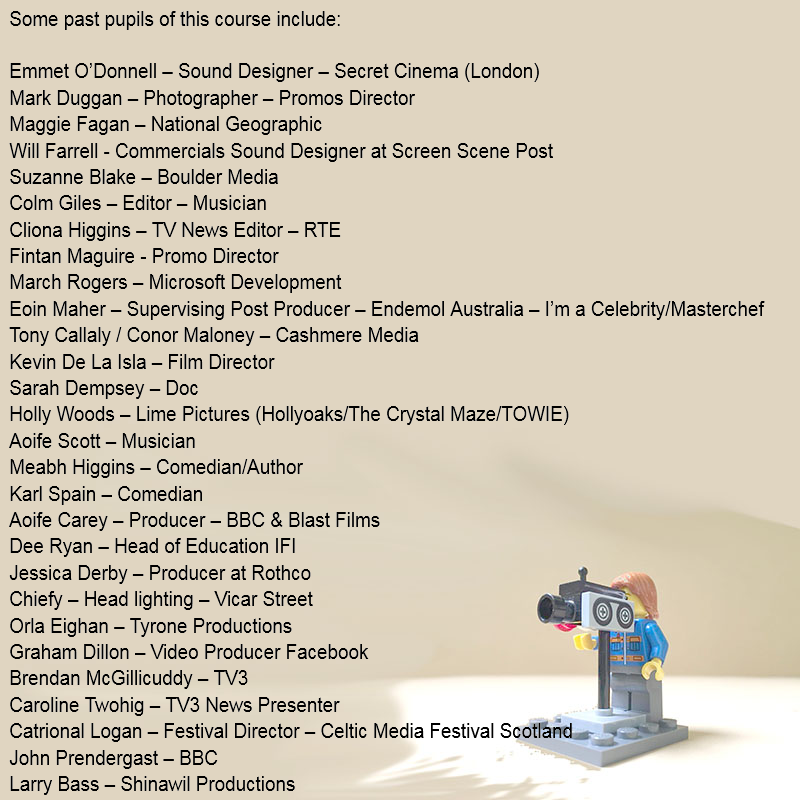 Completion of this course qualifies you to apply to complete the BA Hons in Film and Video Production in Coláiste Dhúlaigh. More details on the BA Top up year are available here. – If you want to continue to develop your career with us, we offer a one year top up degree in conjunction with the University of Wolverhampton (BA Hons Film & Video Production.) which is delivered in our college. This is a far more cost effective option than any degrees offered by Irish Universities. Application details for 2018 are available here. For more information on what’s happening on the degree so far go here. If you’d like to hear some work produced by our students, go to our Soundcloud page where you can hear Music and Radio work made as part of the course. Below are two examples of Documentaries created by our Students. We are also introducing a series of Interviews with Past Pupils of the Course, so if you’re interested in what people did after their time with us, feel free to read the articles below.